Morning, and the frost was thick on ferns already yellow with the changing season. The sun broke from the horizon, thin light stirring the dying insects to crawl for one more day. I pushed the scratchy woolen blankets off my body and stood, shivering, from the bed I made in the meadow. From the small heap of our possessions, I pulled out a gas mask, slipped it over tangled hair. My breath rasped in and out through the filters. Next, a small tin plate and a spoon in my hands. It was time to give Rose her dose. In the center of the clearing, where the clay soil showed red through tufts of dried grass, stood the chamber I’d built for her. The place where my sister would be remade. Clay bricks were stacked in a dome, just high enough for us — women in my family have always been small — to sit upright inside. A flap of waxed hide covered the entrance, pasted down with pine sap to keep her infection contained. Just outside the door, I’d cleared a circle of grass and scraped away the plant litter to expose the pure healing clay. After scooping some of this iron–smelling earth onto the plate, I peeled back the chamber’s door flap and crawled in. Rose, thin and frail, but warm — the earthen walls insulated her from the frost — groped blindly toward me. When her fluttering hands landed on my arm like butterflies, I felt renewed. Here in this chamber, earthen walls pressing in like a womb, was my redemption. Please let me fix my mistake. “I’m sorry I couldn’t warm the mud.” My voice echoed in the mask, tinny. I hated the sound. As soon as I fixed her eyes, Rose could take the mask and walk to the city. I’d move on. North to the places in the old books. Big sky country. The wild arctic far beyond. No one would know me there. I scooped a modest lump of clay and laid the spoon against Rose’s lower lip. She frowned. “Can I have water?” she pleaded. I helped her fingers pinch a second lump of clay to slip into my mouth. It turned to slick mud on my tongue, tasting of spring days, fresh turned earth, seeds dropped into warm furrows. Rose grimaced when she swallowed the first bite. She rubbed her eye sockets, red and raw from the last attempt at implantation. At these words, she wrung her hands. I could tell she was thinking of the hangman’s noose that swung from the branch. Rose didn’t approve. But we were defenseless otherwise. Her lips parted just wide enough for the lump of clay. “And you?” The words were thick, heavy with the mud on her tongue. “I have blankets. I’ll be warm enough until you’re healed.” I couldn’t look at those empty eye sockets. What if the cure didn’t work? After that, she ate steadily, resigned. Once Rose had swallowed her dose of clay, I set the plate aside. It was wrong to wait. We needed to be persistent to make this work. Rose belonged in the city, but she had to make the journey alone; I’d be pilloried if I came anywhere near it. Blind, she’d be as likely to blunder into a cob settlement as find her way home. I didn’t argue, though. I’d spent most of the night awake, shivering, watching the moon glide across the cold sky. It was hard to think straight. Do no harm. The oath was probably much easier to follow in the time before the plague winds. Back when we knew more. When answers came as quickly as a keystroke. The idea of stuffing another pair of clay orbs past her lids, feeling them rasp against the soft inner flesh of the sockets — it was an almost unbearable task when I was at my best. Maybe this afternoon, when I felt stronger, I’d bully her into it. I’d forgotten to remove the mask before I set off in search of raspberries. After sliding a platter of the withered fruit in to Rose and resealing the door flap, I peeled the filter from my face, rubber seals sticking to my cheeks. My skin hurt afterwards from being compressed too long. Clouds had moved in to fill the sky. Steel gray heaven. The diffuse light set the fall leaves blazing, liquid gold on the hangman’s tree, a deep red burn in the scrub oak. Midday warmth had raised the scent of rot from the undergrowth, summer’s bounty gone brown and limp. I cupped water from the stream and drank water so cold it made my fingers ache. The noose swung lazily, stirred by a breeze I couldn’t sense. Leaves fluttered down and landed on the dome of Rose’s chamber. A rock, moss in the crevices, bald granite pate beneath the sky, lay near my sleeping spot in the meadow. I sat upon it, my daily ritual. A chance to pray and remember. Just five months ago, the plague winds had roared into the city, rattling windows and tossing newssheets up like doves. The first victims were shoved through the hospital doors the next morning. Six weeks later, the hospital had almost no beds left. I slept in the doctor’s lounge, ate canned food, showered in occupied rooms. Those showers were the only time I escaped the screams, drowning them with the sound of running water. By the time they brought Rose in, I’d been killing patients for a month. Only the cases who didn’t respond to sedation, the ones who lived in perpetual terror. The hospital kept them alive in their horrorscapes with feeding tubes and IV fluids. I couldn’t bear it, knowing they had no peace and never would, and so began my late night journeys through the ward with a syringe dripping death. Many shift nurses suspected me but no one spoke of it above a whisper. They were grateful for my courage. The night the police delivered Rose, bound and infected, I was pushing a gurney down the hall, dirty linens on the bed that felt greasy under my hands because the hospital laundry couldn’t keep up with the soiling. One of the gurney’s wheels squealed. A man was cuffed upon it, bound hand and foot. The bite stick kept him from severing his tongue. His eyes roved through his waking nightmare, shuddering in their sockets while delusions crawled through his mind. The police carried my sister in through the back gate, directly into quarantine. Rose’s wails raised hairs on necks. Her hallucinations were so severe that she’d dug trenches in her face with her fingernails. I abandoned the gurney and ran, awkward in the bulky hazmat suit, to her side. Nothing dulled Rose’s hysteria. Not ether or chloroform, valium or an orderly’s face, shoved containment mask to nose, yelling at her to wake up. To banish her visions. “Oh Rose, oh Rose.” Years of medical school, and there was nothing I could do to help my sweet sister. I fled quarantine, abandoning my suit on the floor and rushing through decontamination. For hours I ran my fist into lockers and overturned IV stands. My hair came out in chunks between my clenched fingers. Finally, upon a bench, beneath the new–fangled fluorescents that buzzed and buzzed, I conceived a solution. I ordered painkillers before Rose’s surgery. In the months since, I’d never asked if they worked. When I slipped the spoon into the ocular cavity and extracted my sister’s sight, my stomach heaved because I couldn’t help but imagine the pain. My own sister. Do not vomit inside an airtight suit. I ran to the isolation airlock and managed to get my helmet off just as I pushed through the door and vomited. After returning, three hard swallows to strengthen my courage, and I accepted the scalpel from the nurse. Gentle pressure to sever the optic nerves. Rose slept then, at peace. Free from the horrors her eyes had fed her. In the morning, the hospital walls echoed with news of the cure. An injection. Medicine that smothered the virus. And Rose had no eyes. On the morning of the first snow, I was shivering violently when I crawled into Rose’s chamber. The tin spoon clattered against the plate. Curling up against her side, I waited for the warmth to seep into my core. The latest pair of eyes had been smashed into ovals, and tossed against the walls, black smears where her blood had dried. She must have taken them out in the night. “I should have built a second shelter,” I admitted through chattering teeth. It had just seemed so much less important than caring for Rose. “And leave you blind forever?” I would rather have inhaled her infection and lived the rest of my days in a nightmare. Did she not understand? It wasn’t the type of soil or the iron that stained it. It was the place. She’d read the same histories I had; we’d discovered them during our flight from the city, in an old building with broken windows and mouse nests in the stacks. A library in a deserted town that had been full of ghosts since the last plague wind or the one before that. Rose’s smile had been like sunshine when I ran her hand over the concrete and let her hold the fragments of glass that used to be windows. Last week, I’d found a glass beaker half buried by the stream, intact this century later. There’d been a place of miracles here. In this spot, things called stem cells and nanosurgeons had once built bodies from water and the elements. I just needed to combine my knowledge and persistence with the old powers in order to rebuild her. “We can try next summer,” she said. She said nothing more, and I left quickly after her feeding, the press of the low walls abruptly so tight that they squeezed the air from my lungs. I heard her quiet words while I worked the pine sap around the seams. I don’t think she meant for her voice to carry. At first, there was only enough of the drug to inject the plague–afflicted, starting with the severe cases and working down to those who suffered mild delusions. Because Rose was no longer symptomatic, they left her in quarantine, deprioritized for the time being. Hospital staff members were next, and I stood in line with my heart in a pit. Rose was blind. Inside the conference room, he sat across from me, drinking water while offering me none. What could I say? I looked at my hands. I was not ashamed of my actions, only regretful that I hadn’t known they’d been close to a cure. He left when it became clear that I wouldn’t answer or argue. The lights flickered on and off in the empty room. Power fluctuations. My chair was hard and uncomfortable. Through the window, glass crisscrossed with wire for safety, firelight flickered. The city burned and people clamored for the cure. Amongst the mob, angry survivors raised a cry for revenge. Those that were kin to the ones I murdered. I would hang and Rose would starve, unable to work without her sight. Already, I imagined oil soaked rags thrown through the windows of our home. The conference room wasn’t locked — I suppose they didn’t imagine I’d go anywhere. I stepped out and stole through flickering hallways to the quarantine wing to rouse my sister. With Rose’s hand in mine, a mask over my nose and mouth, we slipped out behind the hospital and fled, stumbling, through streets full of rioters. Since entering the chamber, I’d been examining the blackened tips of my toes. Frostbite. If I had a scalpel, they’d come off. From now on I’d have to join Rose at night to prevent more injury. It would be uncomfortable, sleeping with the mask. Her eye sockets looked so much hollower today. When the afternoons warmed enough that my cold–stiff fingers could turn the pages, I’d been reading the Bible, looking for answers from this God that mattered so much to so many people. He made man from clay, the Book said. Relief had poured through me when I read those words. The devout had it right all along, and the nanosurgeons were simply a manifestation of the divine miracle. So why wasn’t this working? “And the director was going to throw you to them?” She probed one of her sockets absently with her index finger. How was I to know? Why was she badgering me with these questions right now? I was so cold. The lack of sleep made it so hard to think. My boot went on over the sock, yanked past my ankle. The leather upper slipped from my hands, and I kicked the wall, sending a vibration through the dome. I heard the anger streaming from my mouth, but I couldn’t stop it. Rose didn’t deserve such words. Dear sweet Rose. I needed to get fresh air. Work on the chores. One of my boots was still off, but maybe the snow would dull the ache in my foot. I started crawling for the door. “Be quiet, Rose, or I swear I’ll leave you alone for a whole day. You’ll just have to take care of yourself.” I worked my fingers under the door flap. A puff of frigid air crawled across my flesh. “No. Stay, Liselle. Listen!” Her hands were claws around my ankles. Rose scrambled forward until her weight pushed me down. She tore the mask from my face. The horror of it hit me like the stench from a tin of rotten meat. Damn her. I struggled, breath held, a laboratory frog pinned and slit to expose the beating heart. I shook my head violently. Tried to shove her off me. Finally, I surrendered to the irresistible urge to breathe, sucking in a deep lungful of her poisoned air. In the moment afterward, I gagged, sorrow–struck. It wouldn’t be long now before terror overtook me. All I could hope was that the hallucinations drew me to some sort of easy death. My own sister, infecting me out of anger that I’d blinded her. I wished she would have tried to talk with me about her frustration. I would have done anything to redeem myself. Given her anything. Frozen in this forsaken meadow. How could she forget all the years we’d depended on each other? But even so, I forgave her for her vengeance. My beloved sister. The fight left my limbs, and I let my weight sink down into the earthen floor of the chamber. Rose was still talking, but I couldn’t listen to her. My poor, dear sister. I had to spare her the agony of hearing me hysterical, ravaged by the plague. Rose was always the delicate one. Better for her to die peacefully, freezing in this chamber made crypt. The cottonwood stretched bare arms to the winter sky. From a heavy limb, the rope dangled. Amanda Forrest (www.amandaforrestfiction.com) spent many years as a programmer and manager in the MMO video games industry before going on hiatus to pursue writing. 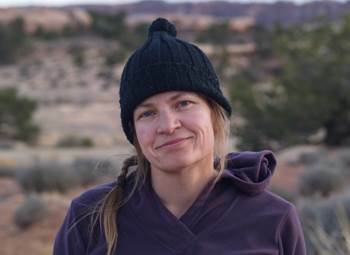 She recently relocated with her family to her small hometown in western Colorado where the empty landscapes provide space for inspiration and the opportunity for outdoor adventures. Her fiction has appeared in or is forthcoming in publications such as Asimov’s Science Fiction, Writers of the Future, and The Dark. This was a fantastic story; loved it!